Safety and comfort are both important factors when choosing an appropriate supplied-air respirator for your individual needs. 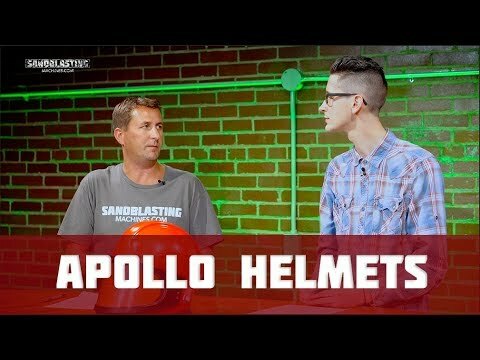 Whether you're looking for a high pressure (HP) respirator or a low pressure (LP) respirator, Clemco’s Apollo helmets are hallmarks of safety, comfort, performance, and are the top choice in the blast industry. We offer Clemco’s full range of Apollo respirators, available in the Apollo 20, Apollo 60, and Apollo 600 helmet models. All models are available as either high pressure or low pressure systems. Which respirator is right for me? The Apollo 20 is the most economical option that delivers a lot of value without compromising on safety. The Apollo 60 features a full-view window and features a heavy-duty, length-waist cape. The Apollo 600 is the most durable option with added features for extra comfort and ease of maintenance. All helmets are NIOSH-approved. The Occupational Safety & Health Administration (OSHA) requires individuals to always wear NIOSH-approved supplied-air respirators in the presence of any dust, including but not limited to handling and loading abrasives, blasting or working in the vicinity of blast job, and cleanup of expended abrasive. Never modify or substitute any Clemco parts with other types or brands of equipment. For compatible parts for your Apollo respirator, you can find our authentic Clemco safety helmet parts here.